Many people who have spent time studying pneumatology (theology of the Holy Spirit) and the gifts of the Spirit will probably be aware of Wayne Grudem and the works he has written around such topics. Grudem believes the charismata gifts of 1 Corinthians 12 still exist today. He is one of the many ‘theologically-minded’ and scholarly Christians now standing as advocates for these gifts of the Spirit. Others are Sam Storms, John Piper, Gordon Fee, Mark Driscoll, Jack Deere, and many other such people. 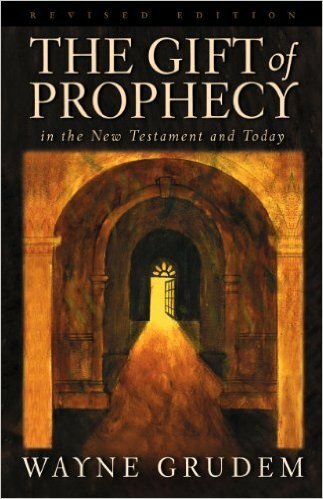 Though one can get a taster of his theological stance on the gifts of the Spirit in his Systematic Theology (pgs1016-1088), another of his writings, The Gift of Prophecy in the New Testament and Today, gives a much more in-depth treatment of the gift of prophecy, as you would expect from such a title. Though the book definitely stands as an evangelical stalwart for study on the gift of prophecy, I believe the book fails to incorporate the full biblical teaching on prophecy, as well as the nature of apostles and prophets. I want to deal with one area where I believe his work has some shortcomings. This revolves around his discussion on New Testament apostles. With this specific matter, Grudem offers what I believe is faulty exegesis on the passages of Ephesians 2:20 and 3:5. You can see his discussions in chapter 2 of the book (pgs45-47), as well as in his Appendix 6 (pgs329-436). Remember, this is in the revised edition from 2000. I don’t believe earlier copies have Appendix 6. New Testament apostles are equal to the Old Testament prophets in their authority. Therefore, these two groups, NT apostles and OT prophets, are the authoritative recorders of Scripture. Subsequently, New Testament prophets have much less authority than New Testament apostles. His conclusion is that the best interpretation can be found with the fourth option. For Grudem, from a New Testament perspective, these two verses in Ephesians teach that apostles and prophets are mainly one joint ministry rather than two distinguishable ministries. Such helps maintain his viewpoint that New Testament apostles are the authoritative writers of the New Testament while the prophets of the Old Testament era were the authoritative writers of the Old Testament. One other major point Grudem brings up to try and prove that apostles and prophets are one group in both Ephesians 2:20 and 3:5 is that, in both instances in, the definite article ‘the’ is found before the word apostle, but not before prophet. Thus, Paul is referring to one joint authoritative group, mainly apostle-prophets. Acts 13:1-3 – Prophets utilised in the apostolic commissioning of Paul and Barnabas together. Acts 15:22-35 – Following the Jerusalem council, Judas and Silas, who were prophets, accompanied Paul and Barnabas on their trip to Antioch. We read that these two were ‘leading men among the brothers’ (vs22) and of their strengthening role they had to the church (vs32). Noting that in vs32 we are told these two are prophets, we can assume that the verse is not simply telling us they were simply doing a little encouraging. But it is highly probable the strength and encouragement came out of their prophetic ministry. Not to mention Silas’ continued role in Paul’s apostolic-ministry team. Eph 4:11-13 – Prophets are part of a team of ministries that are given by Christ to the church to help equip and prepare them for ministry. They have quite a significant role, along with apostles, evangelists, teachers and shepherds. I’m not negating the role of apostles, nor would I even look to negate their primary role within the New Testament. But apostles never replaced prophets in any sense. They both existed alongside each other, as we find in the testimony of the New Testament itself. Prophets were foundation layers, in conjunction with apostles (hence Eph 2:20 and 3:5). Prophets were revelatory communicators, and still are. Therefore, my conclusion is that apostles and prophets are two distinguishable ministries, yet both working together in an all-important, authoritative role within Christ’s body. For practical purposes today, this does not mean we add to the biblical canon, making their words the rule of faith for the entire body of Christ for all time. But, by His Spirit, God still utilises these ministries in relaying revelation from God. And such would make sense, for God has always been communicating even outside the bounds of the biblical canon. This was even taking place in biblical times as Scripture was being authored and inspired by God. So, when God speaks today, it doesn’t mean we write 4 John or 3 Thessalonians or 1 Brussels. It simply means that, as people speak forth revelation (or what they claim as revelation), we learn to weigh it against Scripture, keep it before the leaders we are connected to, keep it before the wider body we are in relationship with, and pray for discernment. It doesn’t make it easy. But it makes us move towards becoming the men and women God desires His body to be – hearers of His word. How amazing to hear the living God through both His written revelation and through His spoken revelation. This entry was tagged apostles, apostles today, cessationism, charismatic, continuationism, Ephesians 2:20, Ephesians 3:5, Ephesians 4 ministries, gifts of the Holy Spirit, Holy Spirit, pneumatology, prophecy, prophets, prophets today, spiritual gifts. Bookmark the permalink. Good stuff. Yes, I must agree with maintaining that distinction between apostles and prophets. It seems better to regard that absence of the article to point to both the apostles and the prophets make up that one foundation, a unit, if you will.